One of the final three reviews will cover the Steeple Chase and Distance events at the UAAP. While the NCAA appears to be more flamboyant in these events, it should be a close contested race in the Mens Division of the UAAP with the boy from Davao City, Rafael Poliquit of FEU whose winning time of 15.35.4 makes him the favourite in this event. Richard Salano of UE (15.44.3) will be his closest competitor. While times being a bit slow in the 10k, Poliquit will have his work cut out for him up against the slightly faster Roger Denolo of UST with both boys clocking 33 minute times. Also in range is Art Thomas Fronda of UE. Whereas Salano should claim gold in the 3k Steeples (9.41.5) well ahead of UST Richard ‘Gongob’ (9.52.1). In the womens event Dalyn Carmen is the favourite in all three long distance events scheduled. 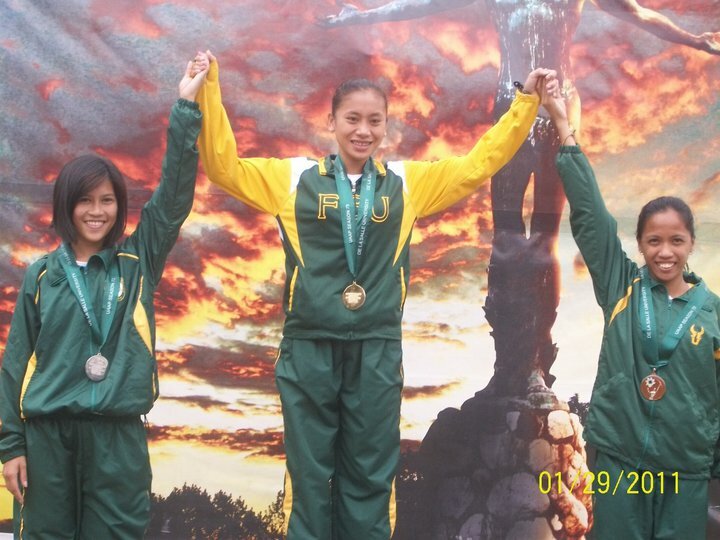 Carmen Dalyn leads a FEU cleansweep in 2011 of the womens distance events at the UAAP, the streak is likely to continue this year due to the depth of talent in the FEU womens long distance ranks. Leading the Womens Steeples is FEU Dalyn Carmen (11.43.8) the #1 steeplechaser in the country in 2011, followed close behind by team mates Mary Ann Dela Cruz (11.50.9) and Nancy Pilaro (11.54.2), which could be a clean sweep for FEU unless UST Jilla Del Rosa (11.56.7) can split the medals up. Dalyn is also leading the UAAP 5k rankings event although she is only ranked #7 in the Philippines in 2011 (19.03.6), however the lead over team mate Dela Cruz (19.04.7) is very marginal. Again FEU is very strong in this event with new recruit 17 year old Jenismyle Mabunga (19.31.7) likely to take bronze and failing that they still have Nancy Pilaro (19.41.7). Again Dela Rosa is surrounded by a sea of green with her best been 19.52. Carmen again leads the 10k with a 40.42.1 clocking with Mabunga, Pilaro, and Dela Cruz again being chased by Dela Rosa. This entry was posted in 05 UAAP News and tagged 3k steeples, Art Thomas Fronda, Dalyn Carmen, FEU Womens, Jenismyle Mabunga, Jilla Dela Rosa, Mary Ann Dela Cruz, Nancy Pilaro, NCAA, Philippine athletics, philippine sports, Philippine track and field, Rafael Poliquit, Richard Gongob, Richard Salano, Roger Denolo, SEA Games steeplechase, track and field, UAAP, UAAP athletics, UAAP track and field, UST track team. Bookmark the permalink.